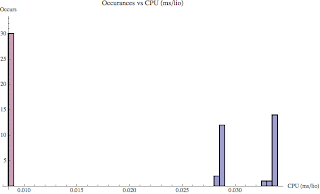 Cache buffer chain (CBC) latch contention is a common top Oracle wait event. There are a number of interrelated causes but also a number of solutions. The trick is to properly diagnose the problem which results in a short list of solutions. The CBCs are created as a hashing structure and are primarily used to determine if a block currently resides in the buffer cache. (More->>) As you can image, even the smallest Oracle systems ask, "Is a block in the buffer cache?" a ga-zillion times each day. If CBC access continues to intensify, at some point the time to acquire the desired CBC latch will be a performance problem. Is there a CBC issue? When CBC latch contention is raging, you're system is likely to have a crippling CPU bottleneck because the application SQL is concurrently and repeatedly checking if specific blocks reside in the buffer cache. If the answer to, "Is the block in the buffer cache?" is usually, "Yes" then IO reads are minimized and memory structure access is maximized...hence the crippling CPU bottleneck and CBC latch contention. 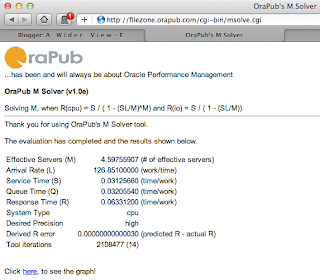 The OraPub System Monitor (OSM and OSM) script I use to interactively determine overall time situation is rtpctx.sql. Here's an example of a 707 second interval. Figure 1. 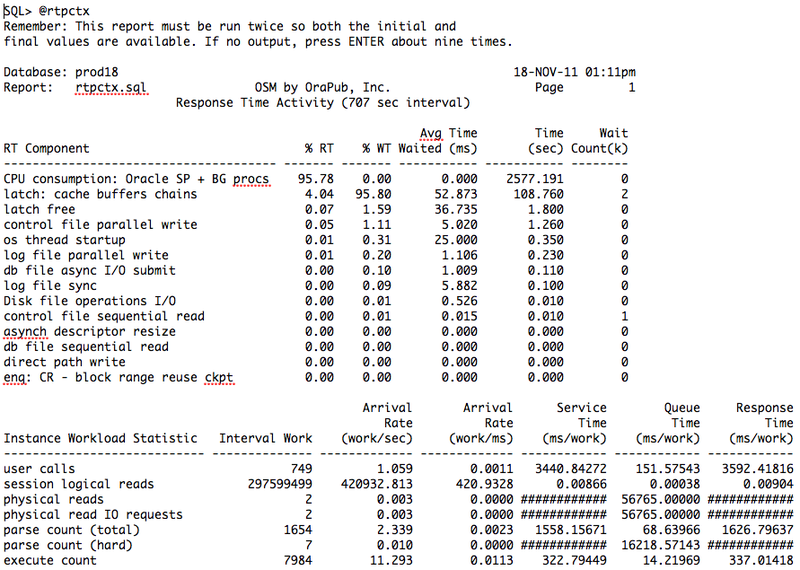 Typical CBC latch contention result based on rtsysx.sql, response time report. 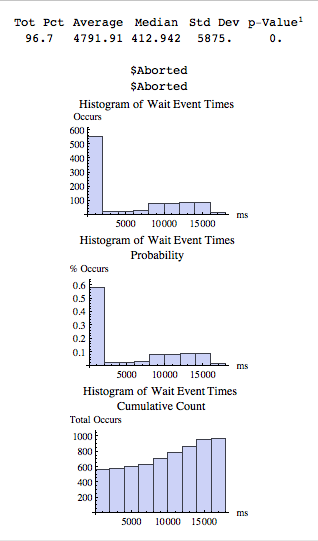 In Figure 1, the rtsysx.sql output the "% WT" column shows the percentage of wait time by wait event over the report interval. 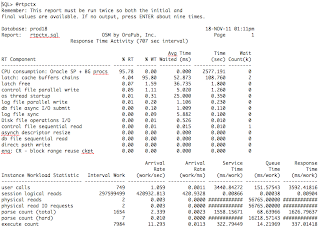 The "% RT" column shows the percentage of the total response time (CPU time and Wait time). The values in Figure 1 are typical when there is a very serious CBC latch contention issue. An AWR or Statspack report will tell a similar story; the top wait event being "latch: cache buffers chains" and most of the system's CPU resources being consumed by Oracle. While there are a number of causes for CBC latch contention, I tend to see two CBC acquisition patterns. The first pattern is when many CBC latches are very active, that is, the access pattern is very disperse. The second pattern when a single CBC latch is very active. So once you know there is a significant CBC issue, the next step is to determine the acquisition pattern characteristic. Read on! Below is some actual output. The "delta" columns are simply the difference between the beginning and ending values for gets and sleeps. Notice there is not a massive gap between the delta_gets and delta_sleeps and there is not a single (or a few) latch that is significantly more active then the others. This would be classified as dispersed CBC latch contention. To really grasp the situation, a visual histogram based on the sleeps is very useful. Figure 2. Histogram of the number of CBC latch address and their respective sleep activity. 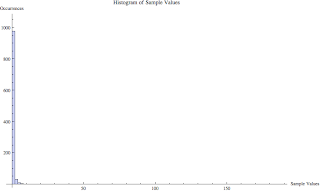 Figure 2 is a standard histogram I copied from the statistical analysis Mathematica notepad (you can download below). Just over 600 CBC latches have zero sleeps while only two CBC latches had eight sleeps. Notice that while there are differences in the number of sleeps, we don't see a pattern with a massive jump like; 0,0,0,1,2,3,5,6,7,1021. Again, this is an example of dispersed CBC latch contention. But sometimes the situation is not very dispersed, but singular towards just a couple or perhaps even one single CBC latch! Figure 3. Histogram of the number of CBC latch address and their respective sleep activity. What is important to us is that there is a substantial delta_sleeps gap separating the top three CBC latches from the rest of the pack. I'm hoping you can see the differences in these access patterns. I would suggest running the latchchild.sql script on one of your systems to see this for yourself. Figure 2 and the code snippet directly above Figure 2 show a typical example of what you'll likely see when many CBC latches are active enough to cause a significant performance problem. Here's the likely situation: There is an intense CBC latch situation along with a raging CPU bottleneck, and you can probably easily see the heavy logical IO (sysstat.session logical IO) SQL as well. There are a number of solutions, with some of them listed below. An Oracle focused solution is to increase the number of CBC latches by increasing the hidden instance parameter, _db_block_hash_latches. An application focused solution is to find the most logical IO intensive SQL and reduce the LIO's by executing it less often or tuning it. Either way, your objective is to reduce the LIOs generated during times of critical performance. An operating system focused solution is to increase CPU resources by removing CPU consuming process if possible, adding more CPU cores, or increasing CPU speed. There are of course other solutions, but I think you get the idea. The Cache buffer chain (CBC) structure is used to answer the question, "Is this block in the buffer cache?" At some point, this question can get asked enough to cause significant performance problems known as CBC latch contention. While there are a number of causes for CBC latch contention, I tend to see two CBC acquisition patterns: The first pattern is when many CBC latches are very active, that is, the access pattern is very disperse. The second pattern when a single CBC latch is very active. So once you know there is a significant CBC issue, the next step is to determine the acquisition pattern characteristic. In this posting I focused on how to determine the CBC latch contention acquisition pattern; disperse or singular. I then presented some disperse CBC latch contention solutions. In my next posting I'll focus on additional steps to diagnose singular CBC latch contention, two common situations, and some possible solutions. Are you sure it's the index root block? Suppose you want to check if a specific Oracle block is an index root block. Why? Here are two very real situations. You notice a specific block is very active and want to know if it's an index root block. Even more common is, perhaps there is a very active cache buffer chain latch related to a specific block/buffer and you want to know if this hot buffer is an index root block. 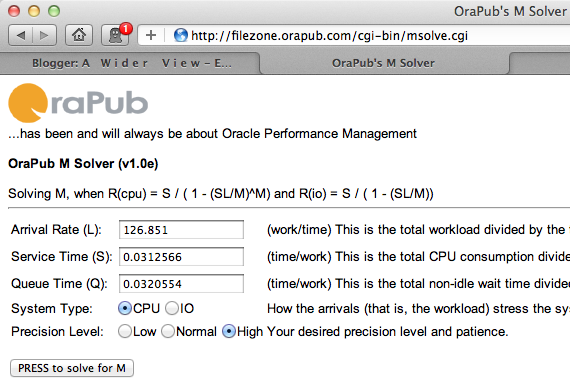 Besides these very real examples, it's also an interesting journey into Oracle internals! Some very respectable blogs and a simple test I ran indicate an index root block is the block after it's segment header block. Figure 1. 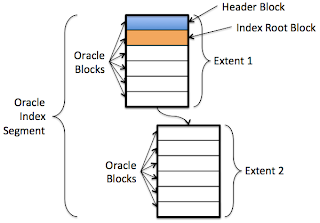 Diagram of an Oracle index segment, highlighting the index root block. Figure 1 is a diagram of an Oracle index segment. If it wasn't for the index root block, Figure 1 would be a good diagram for any Oracle segment. The light blue colored block is the segment header block. Notice the orange colored index root block follows the segment header bock. As mentioned above, folklore says if the segment is indeed an index, then the orange block will be the index root block. And not just now, but for the life of the index! Wow... This is a pretty strong statement and one that needs to be tested. So that's what I did and what this posting is all about. We need to determine if the block following an index segment header block is the index root block... for always and forever until the index is dropped. First, just dump the index and locate the root block's data block address (DBA). 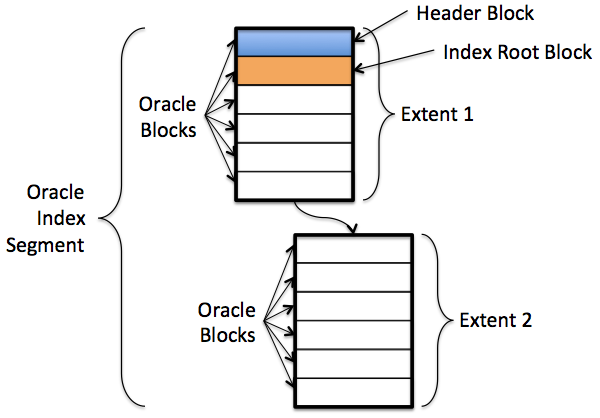 Second, get the DBA for the block following the index segment header block. And finally, compare them. If they match, then we have shown a situation where the block following the index segment header block is indeed the index root block. So let's do that. And here's a snippet of the trace file from near the top. The first/top mentioned "branch" block is the index's root block. In this case, the index root block has a data block address (DBA) of 5002337. Now let's get the data block address for the block after the index's segment header block. But first we need to get the file number and block number of the index segment header block. Now let's get the data block address (DBA) for the block just following the header block. We must remember to add one to the header block number, so the block number we are interested in is 808033. Do you see it? The DBA just above (with the header block + 1) matches the first/top "branch" block's DBA (5002337) from the index trace file! So now we know how to check if the block following the index's segment header block is truly the index root block. Now the question becomes, does it always remain this way? For example, what if create the table, create the index, and then insert rows into the table? Or what if we create the table, then insert rows, and finally create the index? If that's not enough, how about this: What if the index grows and splits? Or how about if we delete all the table's rows, insert rows until the index splits? Or how about if it we truncate the related table? As you can see, there are an infinite number of possibilities and there is no way we can test all of them. I created a number of tests that could be repeatedly run and easily modified and extended. There are two related scripts. The driving script is a SQL script called, doRbExpr.sql and takes a single argument, called the prefix. This prefix is the begining name of all the objects the script creates. This allows you to quickly and easily re-run the script without first removing all the objects from the previous run. The second script, getIdxRtBlk.sql, retrieves the index root block's DBA from both the data dictionary and by dumping the index, and then nicely displays them so you can easily see if there is a difference. I also show the index depth (blevel) as an added test to help ensure I'm looking at the current statistics. Click here to see the results. As you can see, in every case the DBA of the index segment header block plus one, matches the index trace file's root block. I have rerun this test many times, and the results are always the same. Actually the experiments prove very little, yet they yield a tremendous value. The experiments clearly and repeatedly demonstrate that I have not found a way to disprove an index root block is the block immediately following its segment header block. All it would take is just one of my experiments to break the "block after" rule... but I could not break the rule! If you can devise a situation to break the rule, please let me know and I'll post it. So next time you need to check if a particular block is an index root block, simply get it's segment header file and block number, add one to the block number, and compare. In my opinion, that's much easier and faster than dumping the index, parsing it, etc. 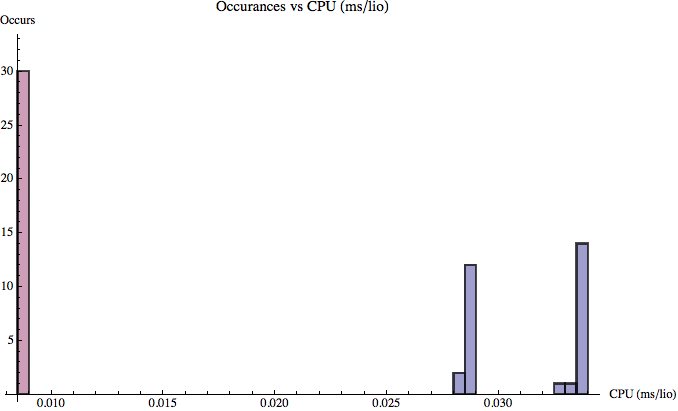 If the average db file sequential read is 20ms, it is likely the typical value is something more like 5ms. 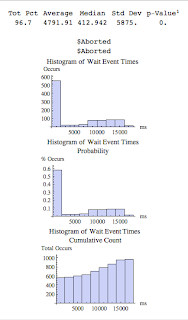 If you look at your system's wait event time distributions, you will see (details below) that an average Oracle wait event time is not likely to be the typical wait time and the distribution of wait times is not likely to be normally distributed. So when you approach your IO team about the 20ms sequential read time they may look at you strangely and can honestly say, "When we watch the IO times, we see nothing like this." 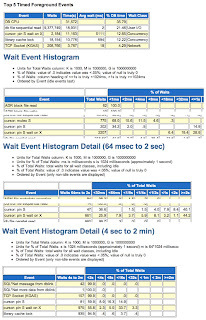 This posting takes a closer look at the typical wait event time, wait event time distributions/patterns, how YOU can determine the typical wait times (plus other statistical data), and plot a histogram... all based on a standard Statspack or AWR report. ...good stuff! I first need to mention that many Oracle IO requests do not result in a wait event occurrence. I blogged about this in my "IO Read Wait Occurrence Mismatch - Part 2" posting back in January of 2011. So that in itself can be enough to drive a wedge between you and the IO team. In this posting, I'm going to focus on wait event times, not why the IO subsystem response times may not match Oracle IO related wait event times. It's an interesting discussion for sure, but not the focus of this posting. 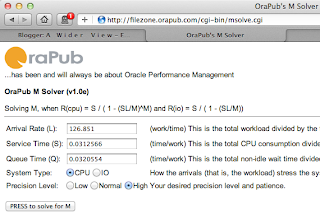 Way back on November 20, 2010 I posted an entry entitled, The Average Challenge... Part 1 focused on why using the statistical average to describe common Oracle performance happenings can lead to a gross misunderstanding of reality. To demonstrate my point, I operating system traced (Linux: strace) server processes, the log writer, and the database writer. I created histograms based on the data collected and posted those graphics in the blog entry. In this posting, I will present below how you can do the same thing using data from v$event_histgram and from an AWR or Statspack report. The challenge is, averages are usually reported to us and they are easy to calculate, so we tend to use them. Worse though, is when we say something like, "The average multi-block read wait time is 20ms." most people immediately assume most values are pretty close to 20ms and it's just as likely a value will be greater than the average then less than average. That is far from reality. Not even close. This means we are effectively misleading people by failing to communicate properly. And as a consultant and a teacher, it really really really bothers me when I'm not being clear or correctly understood. All this thinking about averages led me on a fantastic quest into some very interesting and surprisingly practical study. First, I needed to gain a better understanding of statistical distributions. To document my research, I posted a blog entry entitled, Important Statistical Distributions...Really. 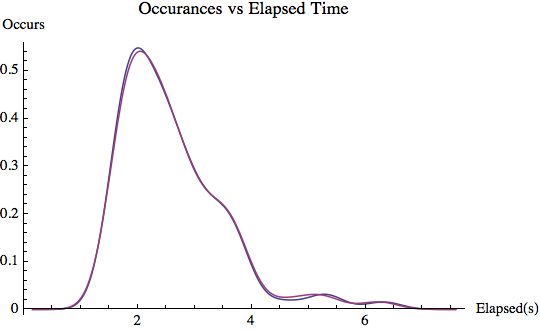 I also spent some time investigating "average" SQL elapsed times and also SQL arrival rate patterns. The results where stunning, disappointing, and enlightening all at once! Currently, I am presenting some of the results of this research in my conference presentation, SQL Elapsed Time Analysis. At this point in this journey, it's time to blog about wait times. Not a specific wait event, but the actual wait times and how to describe what's actually occurring. Knowing that saying the average wait time is Xms can be seriously misunderstood, the practicality of this is huge. I am no longer satisfied in speaking about averages. We need to get a much better understanding of what the typical value is and understand the wait time pattern (i.e., distribution). That's exactly what this blog entry is all about; understanding wait time patterns, how to get good data, understanding the data, how to numerically and visually show the data, and how to better communicate what the data actually means. 1. The bin size can be quite large. For example, a bin size of >8ms to 16ms. That's a bin size of 8ms! Plus much of the really interesting times center around 10ms. 2. The bin sizes change, that is, they increase in powers of two. 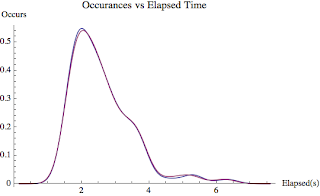 This makes visualizing the distribution (think: histogram) of the wait times extremely difficult for us humans. That's why I created a tool to help us accurately visualize the data... more below. 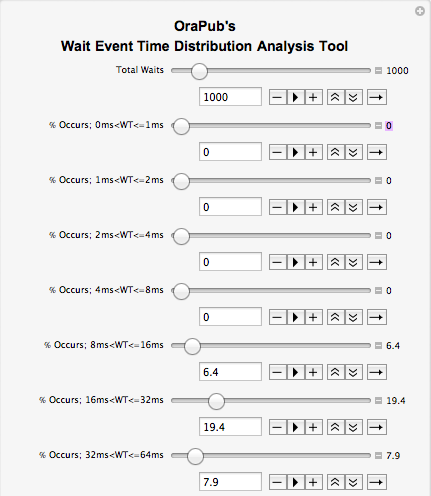 For every wait event, Oracle stores the wait event occurrence in the 10g performance view v$event_histogram. The view is very straightforward here are a couple of links (swhist.sql and swhistx.sql) to tools in my OSM Toolkit that pull directly from this view. In addition to directly pulling from the source v$event_histogram view, more recent Statspack and AWR reports provide this information in varying levels of completeness. The formatting is a little bizarre, but with a little practice you can grab the histogram bin values necessary to create the statistics and the histogram we need. Figure 1. 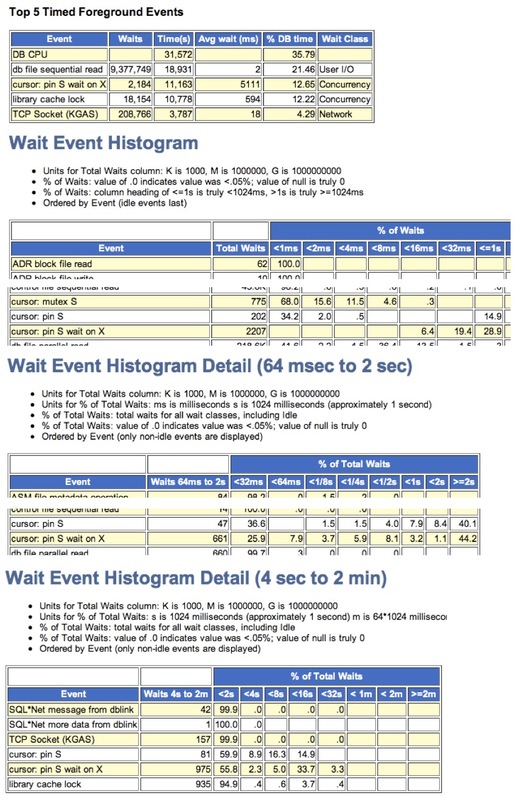 Example of Oracle wait time occurrences placed in time-based bins from an AWR report. Figure 1 above is an example of v$event_histogram data for the wait event, cursor: pin S wait on X. (my ref: 20110425_0800_0900.html) If you look at the top part of the Figure 1 you'll notice the average wait time is 5,111ms, which is 5.111 seconds! So what is the typical value and what does the distribution look like? To answer these questions, I created a Mathematica based tool that uses the bin inputs from v$event_histogram, Statspack, or an AWR report. How to get the tool and use the tool is explained next. I created a nice little tool called, OraPub's Wait Event Time Distribution Analysis Tool which can be downloaded and used for free HERE. The interface is not as clean as I'd like, but to make the tool freely available without you having to license Mathematica, this is what I had to do. The AWR event histogram data is provided in percentages. 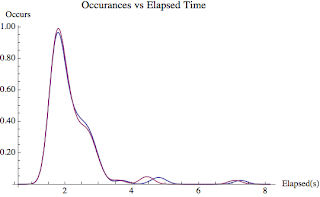 For example, if you look closely at Figure 1, you'll see that 6.4% of the wait event occurrences for the cursor: pin S wait on X were between 8ms and <= 16ms. It's a little strange the first few times you retrieve the wait time data, but you'll get the hang of it. For the event, cursor: pin S wait on X in Figure 1, the bin data is as follows (0ms to <=1ms, 1ms to <=2ms, 2ms <=4ms, ..., 4096ms to <=8192): 0, 0, 0, 0, 6.4, 19.4, 7.9, 3.7, 5.9, 8.1, 3.2, 1.1, 2.3, 5.0, 33.7, and 3.3. Remember that these values are percentages and should add up to 100, that is, 100%. The situation shown in Figure 1 is indeed an unusual distribution of values. 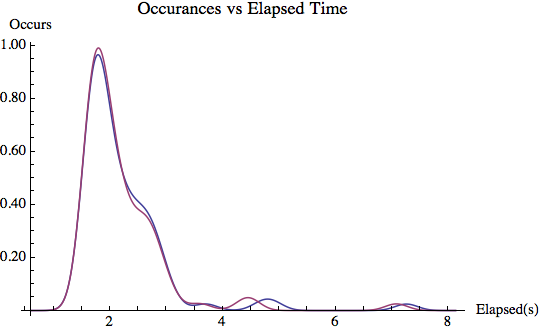 Most wait event occurrences tend to be heavy near the beginning (e.g., 1ms) and extremely light at the end (e.g., 8sec). Figure 2 below shows most of the data entry area expanded along with the data entered. This version of my tool doesn't provide entry for the final 3.3% of the wait occurrences, which are wait times between 8192ms and <= 16384ms. Figure 2. Partial data entry area of analysis tool. Figure 2 above shows the upper portion of the data entry area of the tool. Rather than using the slider bar, data entry is much easier if you click the "+" sign for all the entries areas and then actually type in the values. Every time you press the "tab" key the tool will recalculate, so try to avoid this. For the Total Waits entry, start with 100 and then go to 500 or 1000 for the final graphs. Do NOT enter the actual number of waits that occurred as this will take too long to render the histograms. Plus once you get over a couple hundreds samples, the results will be basically the same. Figure 3. 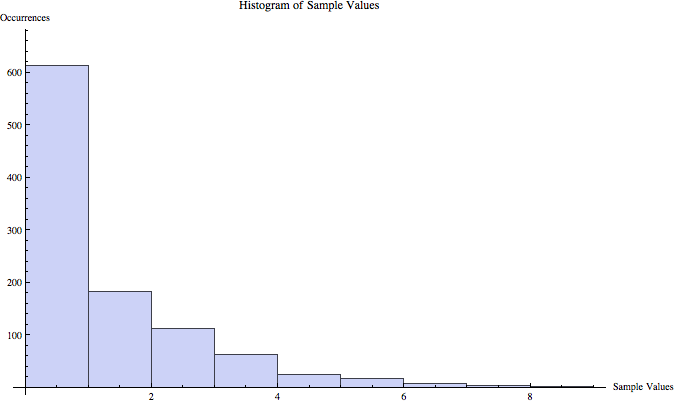 Statistical data and three of the possible five histograms based on Figure 1 and Figure 2 data. Figure 3 above shows some key statistics (e.g., median) and three of the five possible histograms. The first two histograms did not render. The first $Aborted histogram has the bin size set to 1ms and it was not possible to show over 8000 histogram bars! The second $Aborted histogram has the bin size set to 2ms and again, it was not possible to show over 5000 histogram bars. Tot Pct is the total percentage of wait time entered. You may recall the tool did not have a data entry field of wait times between 8 and 16 seconds, which in this case was 3.3% of the values. Since the wait event percentages we entered adds up about 97%, it appears we entered the data correctly. Average is the statistical mean. This should be close to the average wait time reported in the AWR report. The AWR reports shows the average wait time is 5111ms and the data I entered combined with the limitation in bin details, the tool determined the average was 4792ms. That's a 6% difference. Considering the crazy event time dispersion, that doesn't bother me. Median is the statistical median, which when there is a single mode (i.e., histogram peak), is usually the typical value. The value is 413ms, which is over 4 seconds less then than the average! Wow, what a difference and this is why taking the time to do this can be very worthwhile! I will write more about this below. Std Dev is the standard deviation. This is gives us an idea of the data dispersion, but when the data is not normally distributed (think: bell curve), which this data set not, this can be very valuable in communicating the data value dispersion. p-Value is the statistical p-Value comparing the data with a normal distribution. Basically, if the p-Value is greater than 0.05 then the data is likely normally distributed (think: bell curve). I have yet to see wait event times be normally distributed. It's no surprise then, even at 5 decimal places (which you can't tell from the display), the p-Value rounds to zero. Figure 3 above also shows the resulting histograms. Usually, five histograms will plot. The first three are standard histograms, but with different bin sizes. The first and second, which aborted, I set bin sizes of 1ms and 2ms respectively. Usually, it is useful to see the distribution at this level of detail. Usually, the wait event times are relatively short and I want to see the details at the short duration times, hence my setting the bin sizes to 1ms and 2ms. However, in this case the interesting times are much larger than one or two milliseconds. 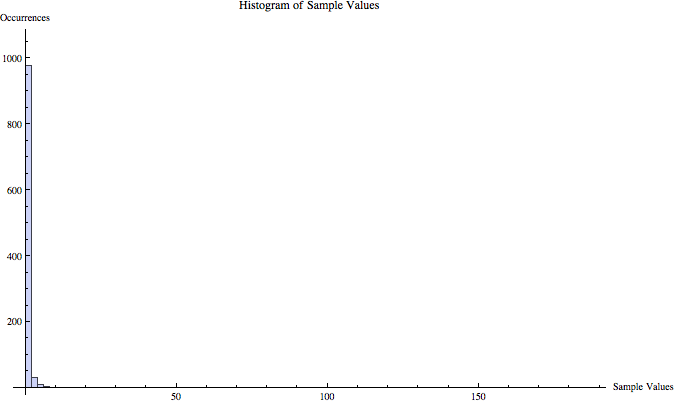 The third histogram Mathematica automatically sets the bin size. Usually all three histograms are created. 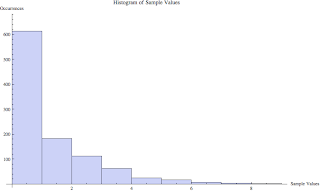 The fourth histogram is a Probability Histogram. 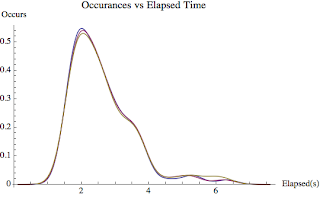 In Figure 3, the Probability Histogram tells us that about 60% of the values occurred within the first bin, which is between 0ms and <= 1,667ms (5000ms/3 bars), that is between 0 and <= 1.7 second. The fifth histogram is the Cumulative Count Histogram. This is just another way to get an understanding of how the data is distributed; based on the number of wait occurrences, not the percentage. Now let's use the tool to learn something interesting, and yes useful, about the cursor: pin S wait on X wait times. First, notice the mean and median are very different. This is typical. It is common for the median (usually the "typical value") to be less than half of the average. In this case it is a factor of 10. The average is around 5 seconds and the typical value is around 1/2 second... a massive difference. This is important: Notice that the AWR report (shown in Figure 1) and the subsequent data entered into the tool (not shown in Figure 2) shows that 33.7% of the wait time occurrences are between 8 and 16 seconds. In our minds, it is common to think there is a massive buildup around 8 to 16 seconds. But there is not! We need to remember that 33.7% of the wait occurrences are spread, that is dispersed, over 8 seconds! Not 1ms, 2ms, or 4ms as with near the left portion of the histogram. This is why it is so important to SEE the data in a histogram. And the difference between the mean and median also helps accentuate this. This is just one example where Oracle wait event times are not normally distributed and therefore speaking in terms of "average" miscommunicates what is really occurring. 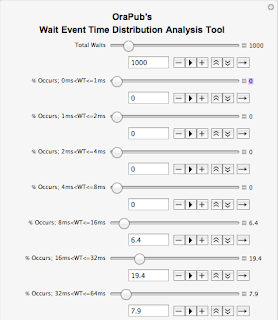 When you need to have a deeper understanding of the timing situation and visually see the situation, you can use v$event_histogram data combined with OraPub's Wait Event Time Distribution Analysis Tool. 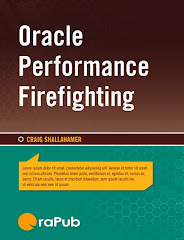 Have fun and all the best in your Oracle performance endeavors!